Deacon Richard Lee Jennings, Jr. Celebrating the life of Deacon Richard Lee Jennings, Jr.
Be the first to share your favorite memory, photo or story of Deacon Richard . This memorial page is dedicated for family, friends and future generations to celebrate the life of their loved one. 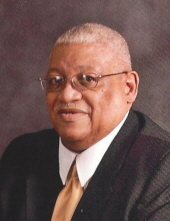 Obituary for Deacon Richard Lee Jennings, Jr.
Deacon Richard Lee Jennings, Jr., the son of the late Richard Lee and Willetta Jennings (Friend), was born on January 4th, 1938 in Chester, Pennsylvania and transitioned to glory on January 31st, 2019. He gave his life to Christ as a teenager at First Pentecostal United Holy Church in Chester, Pennsylvania where he was a junior usher, sang with the junior choir and the Nathaniel Gospel Choir. He attended Chester Public Schools and graduated from Chester High School in 1955. After graduating high school, he joined the United States Navy and became a certified Navy Corpsman (Medic). In 1959, he married his childhood sweetheart Alice Butler, started a family, and settled in Philadelphia, Pennsylvania. Deacon Jennings was honorably discharged from the US Navy in 1967. He then moved his family to Linden, New Jersey and was employed by National Tool and Die Co. in Kenilworth, New Jersey and held various positions until he retired as a Draftsman Supervisor in 2001. In 1967, the Jennings family joined Morning Star United Holy Church under the tutelage of the late Bishop Irvin Evans. Deacon Jennings was the first church psalmist who traveled with the Pastor when he preached and was the first choir member. He was totally committed to Morning Star under the late Bishop Irvin Evans and under the current pastor, Dr. Therman E. Evans for over 50 years. He served in many capacities in the church such as Deacon, Sunday School Teacher, Superintendent of Sunday School, Chairman of the Finance Committee, and lastly Chairman of the Deacon Board where he retired as Deacon Emeritus. Deacon Jennings loved all sports and was a fan of the Brooklyn Dodgers and the Cleveland Browns. He loved singing, music, reading, crossword puzzles, traveling, the beach, swimming and especially going on cruises. He could tell you all about the various ships and ports. He loved his family, his church family, mentoring, and led many to Christ during his lifetime. He was predeceased by his brother, Nathaniel Jennings. Deacon Jennings leaves to carry his legacy, his loving wife of 59 years, Alice; five children: Charlotte, Dwayne (Danielle), Shari, Richard and Dionne Bostick (Cleo); sister, Evangeline Jackson of Collingdale, PA; seven grandchildren: Maurice Tobe, Arielle Dance, Dwuan, Shjonaé, Jamon (Andrea), Jawahn, and Richard Jennings; five great-grandchildren: Teelyn, Amalia, Titus, Kadin and August; two sisters-in-law: Gloria Daniels of Chester, PA and Vernice Matthews (Clarence) of Trenton, NJ; and a host of nieces, nephews, and spiritual children. To send flowers or a remembrance gift to the family of Deacon Richard Lee Jennings, Jr., please visit our Tribute Store. "Email Address" would like to share the life celebration of Deacon Richard Lee Jennings, Jr.. Click on the "link" to go to share a favorite memory or leave a condolence message for the family.